This is the map we've all dreamed of seeing. It's a depiction of Earth in which its primary geological features have been inverted, showcasing a planet with a sprawling landmass that extends across two-thirds of its surface. We've featured the work of Swedish artist Sanna Dullaway (aka Mygrapefruit on DeviantART) before, including her incredible re-imagining of 29 of history's most iconic scientists in one photograph. But this one is quite jaw-dropping. The image can be a bit disconcerting. 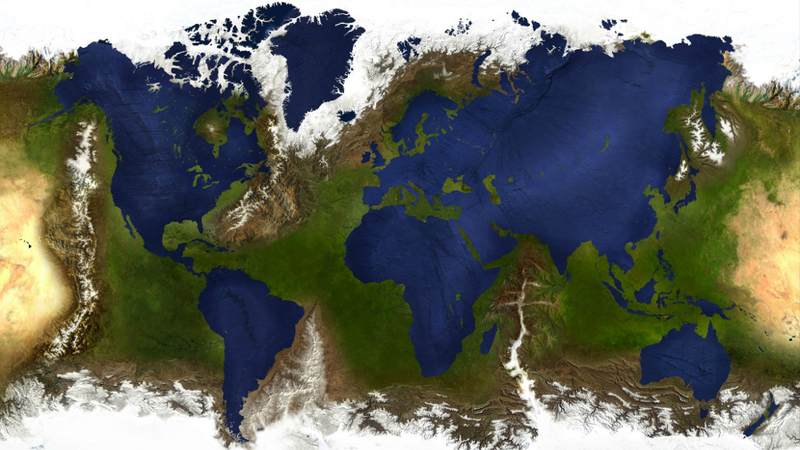 It's difficult to not see the oceans as continents. But a closer look uncovers the Great Lakes Islands, a huge Pacific landmass pock-marked with small lakes (including the Hawaiians), and a very strange peninsula stretching from the East into the Africa Sea — not to mention the freaky and massive Hudson's Bay peninsula. Be sure to check out Sanna's webpage.